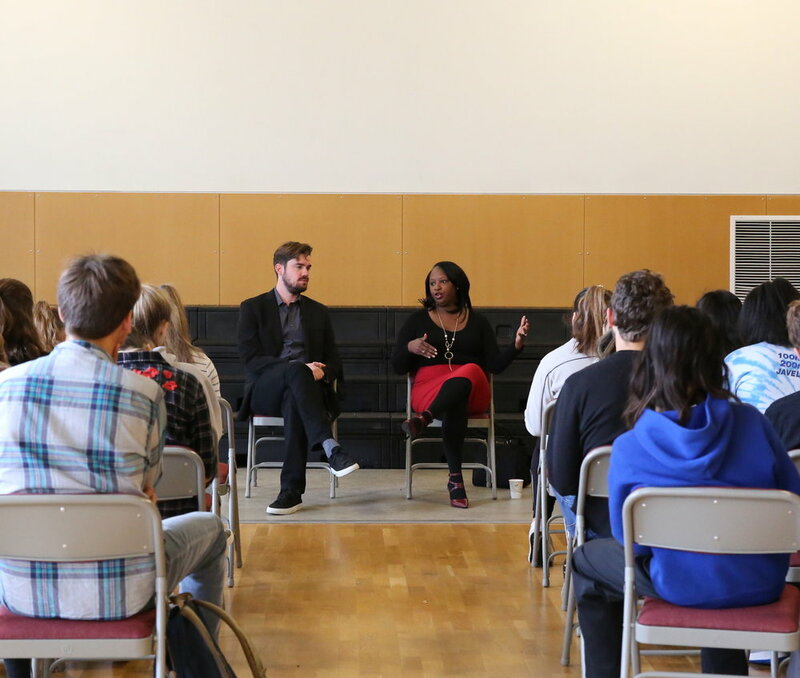 This past Tuesday's 8th grade Monthly Constitutional featured TPS alum Ben West '93 and Natasha Taylor-Smith. Ben and Natasha, assistant federal defenders in Philadelphia, spoke about what drew them to public service, particularly to the defense of indigent clients. Natasha and Ben's 50-minute presentation somehow also managed to include a discussion of merit selection versus election of judges in Pennsylvania, the practice of stop and frisk, federal versus state jurisdiction, mass incarceration, and the 13th Amendment. The final question directed to Natasha and Ben was, "When you were in middle school, was there anything that you were studying that you weren't particularly passionate about but has had a big impact on your career?" Natasha mentioned reading nonfiction, which she later realized had opened new places and new perspectives to her. Ben mentioned Spanish (with Marco! ), explaining, "I am fluent in Spanish, and I can speak directly to my Latino clients without using a translator. My clients appreciate this, and I can establish a better and more trusting relationship with them by speaking with them in the language in which they can best express themselves."